My nightly routine is a daily ritual I look forward to. It helps me relax my mind, check in with myself, and practice simple self-care. Sticking to a consistent nighttime routine is also a good place to start if you’re looking for a better night’s sleep. And who doesn’t love that? My recommendations for creating a simple nighttime routine center around four areas that I’ve found to be most impactful for myself: mindful eating and drinking, detoxing from screens, prioritizing comfort, and promoting restful sleep. Ask yourself: What makes going to bed great? If I'm feeling stressed at the end of a long day, I drink Calm 365 Everyday Value, Magnesium Lemon Fizz. The ingredients are known to help promote positive brain functioning, and the mineral comes with a plethora of physical health perks as well. I take my Contigo Tumbler everywhere I go. It's simple, reliable, and has an autoclose lid—which also happens to be great if you're mixing in supplements like magnesium. It's definitely a personal preference, but having my favorite tumbler by my side helps me prioritize hydration and mitigate the negative effects dehydration has on sleep. 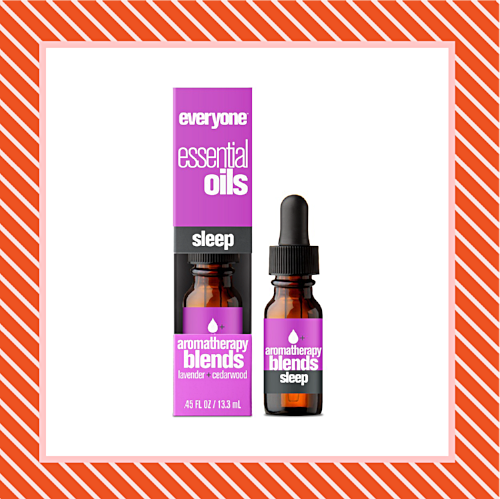 Everyone Essential Oils - Sleep contains a serene blend of orange, lavender, frankincense, holy basil, Himalayan cedarwood, and hinoki oil extracts. Add them together and you get a relaxing combination that will put you in exactly the headspace you need to fall and stay asleep. I start and end every day with my Five-Minute Journal. What I love about using this journal before bed is its daily prompts to reflect on the positive aspects of my day, as well as any areas I could have made better. The journal's simple structure helps my mind focus on positivity and growth before closing my eyes and starting another day. One of the best ways to relax your body and mind at the end of a long day is by taking a nice, warm bath. Dr Teal's® Epsom Salt Soothe & Sleep Lavender Soaking Solution is the perfect tool for winding down with its soothing lavender essential oils that relieve stress and promote a better night's sleep. I started wearing a sleep mask in college—and I'm not sure I'll ever be able to go back. It's perfect for blocking out unwanted light while you sleep. The Tranquility Therapeutic 100% Silk Sleep Mask is a personal favorite because it's inexpensive, effective, and great for routine washing. The AVANTEK White Noise Sound Machine comes with 20 soothing sounds, and it's by far the greatest addition to my nightly routine. If you live in a city, have loud neighbors or roommates—I'd strongly recommend trying a sound machine to block the sounds that keep you up at night.